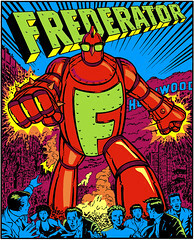 The Frederator Studios Blog: NASA. Postcards, Series 5. Record labels. Postcards, Series 5. In 1977 my mentor Dale Pon let me in a fantastic secret: Some of history's most spectacular images, the NASA photos from space, were available to any American at the Library of Congress. For FREE. Starting with the now famous astronaut planting the MTV flag on the moon (and the model for the 'moonman' statue for the Video Music Awards) I've been able to take wonderful advantage of this taxpayer opportunity. And you too can find this high resolution photography at the NASA website for any reasonable use you might have.